GSI director, abby mohaupt, and CreatureKind co-directors, Sarah Withrow King and David Clough, on the campus of Santa Clara University in San Jose, CA. While environmental advocacy and animal advocacy groups have often been at odds with one another, Green Seminary Initiative and CreatureKind believe that a holistic, effective approach to creation care must include attentiveness to both the breadth of environmental issues and the particular concerns raised by industrial farming practices. Green Seminary Initiative (GSI) fosters efforts by theological schools and seminaries to incorporate care for the earth into the identity and mission of the institution, such that it becomes a foundational part of the academic program and an integral part of the ethos of the whole institution. CreatureKind’s mission is to encourage Christians to recognize faith-based reasons for caring about the well-being of fellow animal creatures used for food, and to take practical action in response. 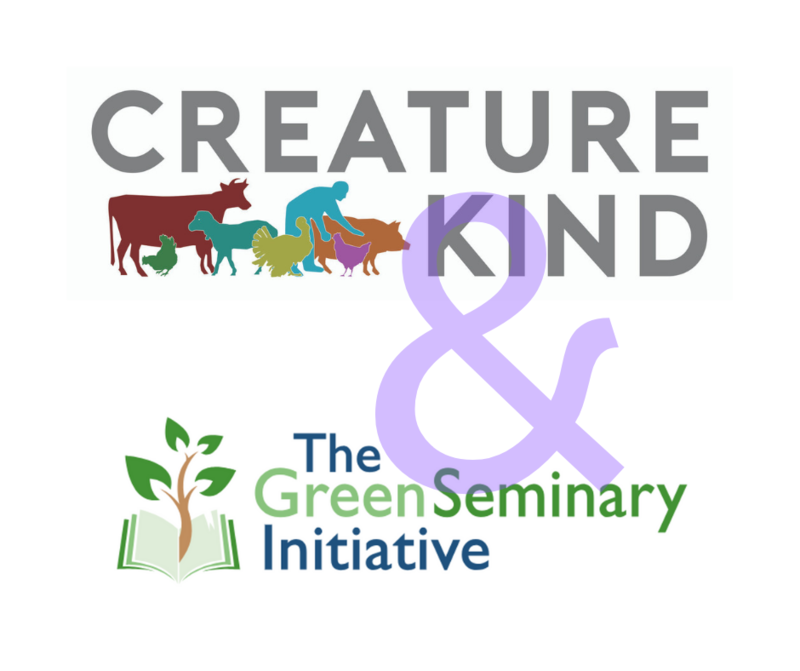 Today the two organizations announced a formal partnership that allows CreatureKind to work with GSI schools to help them achieve GSI’s certification standards related to food policy and to encourage them to include concern and action for animals in other areas of community life. As an organization committed to many faith traditions, GSI understands that food and eating are central to multiple religions, as well as to spiritual formation. The consumption of food is a human experience that crosses ethnic and geographic barriers, and many religious traditions see animals as sacred in some way. GSI is also committed to paying attention to the ways in which environmental justice interlocks with justice for the poor, workers, and other marginalized communities. CreatureKind calls attention to the abyss that currently exists between what Christians believe about animals and how we treat them in industrialized food production. Concern for animal well-being is deeply rooted in our Christian faith, and there is a long history of Christian leadership in animal protection movements. But as industrialized systems of animal agriculture have developed over the last century, churches have remained mostly silent about our radically altered relationships with pigs, chickens, turkeys, fish, and cows (and with the people who work to produce our food), and the devastating consequences of animal factories on the broader environment. Scientist and policy analyst Václav Smil has estimated that from the year 1900 to the year 2000, the biomass of all domesticated animals increased from three and a half times to twenty four times the biomass of all wild land mammals. During that same period of time, the biomass of wild land mammals was halved. It’s no coincidence that these same hundred years saw the demise of the small family farm alongside the birth and global spread of factory farming, which is now the dominant means of producing animal products for human consumption. As more and more land is consumed by animal agriculture, the wild animal population shrinks, and there are additional urgent problems caused by increased consumption of animals. In addition to Industrial farms and slaughterhouses cause widespread environmental damages and use a disproportionate share of earth’s resources, while subjecting animals to painful physical mutilations, miserable living conditions, and traumatic deaths. Workers within the industrial farming system endure long hours, frequent injuries, and unjust working conditions. The increased use of antibiotics has contributed to the rise of so-called “superbugs,” and the overconsumption of animal products has been linked to a host of human ailments. In the United States, the vast majority of animal products—meat, milk, and eggs—are now produced on these intensive farms, where it is impossible for creatures to flourish as their Creator intended and where both humans and animals pay a high price for the availability of cheap meat. These factory farms and other unsustainable food management systems are odds with theological institutions committed to teaching and embodying environmental justice for workers, consumers, and animals alike. That’s why GSI requires schools in their certification program to offer vegetarian food choices at all meals and to include organic and/or local produce at all meals. Electives in the program include the 30% reduction of the amount of meat served over three years, vegan options, and cage-free eggs. Worldwide, more than 70 billion fellow land creatures and up to 7 trillion sea animals are killed for food each year. The use of animals for food massively dominates all other human uses of animals, and yet farmed animals—the animals on our plates—are conspicuously absent from the vast majority of Christian conversations about stewardship, creation care, and the environment. The partnership between GSI and CreatureKind seeks to correct that oversight. CreatureKind will join GSI and other partners at the Southwest Symposium on Ecologically Informed Theological Education at Brite Divinity School on March 13-14. More information can be found here.